You are not alone in your need to have fast, accurate translations completed at a reasonable budget. That’s why BURG offers post-edit machine translation. The process begins with a machine translation. First, the machine compares common phrases and strings of text to a database of previously translated text. If available, it translates the text in seconds. Then, the rest of the content gets translated word-for-word by a machine. As anyone who has ever used machine translation before knows, the outcome is not always accurate. The different rules of grammar between languages and other subtle nuances make it impossible for a machine to translate text with complete accuracy. That’s when the post-edit process begins. With the machine translation in hand, a human translator gets to work cleaning up the text. He infuses his knowledge of both languages and cultures while editing the content. In the end, the text sounds like a native speaker wrote it. 1. Faster results. When a person translates a piece of text from scratch, it takes a significant amount of time. Machines, on the other hand, translate thousands of words in seconds. By getting the dirty work out of the way and automating as much of the process as possible, you get a faster turnaround time on your project. 2. Relevant cultural nuances. One of the biggest concerns with machine translations is the lack of human touch. Human translation includes cultural nuances that a machine has no way of knowing. With a post-edit machine translation, you get the human touch needed to add in relevant cultural nuances. These nuances can heavily influence the way people receive your content, so they are critical to include. 3. Added local references. Local references are equally as important. Often, a machine does not translate these correctly. Street names, parks, cities, and other names may get muddled and confused in the machine’s version of the content. With a human making the necessary adjustments, your content will read better. It will have an authenticity to it that your audience needs to see to trust your brand. 4. Confirmed industry jargon. Industry jargon is especially challenging in industries such as legal, pharmaceutical, and life sciences. These and other industries use specific words that sometimes translate differently, losing their meaning. With a human going through to edit the content after the machine has done its work, industry jargon is accurate. 5. Maximum efficiency. BURG and other translation companies have spent a good deal of time comparing which model is most efficient. The post-edit machine translation approach continues to see the biggest, best results in the shortest amount of time. 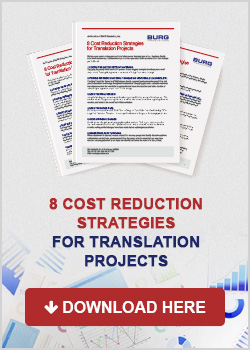 You will not break your budget, and instead you will still get the best translation in the shortest amount of time. There are many benefits to using the post-edit machine translation model for your next big project. If you are unsure if this model is right for you, contact BURG to learn more about whether this approach is a good fit for your project. Glad to visit your site. Recently i was in confusion should i use Machine Translation for Customers Translations Services or not. Thanks too you who cleared my doubt. Hi Selina! I’m glad your found this information useful!